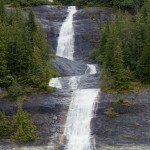 There are several options for glacier viewing in Southeast Alaska. No visit to the region is really complete without a chance to witness the raw power of nature as embodied in a tidewater glacier. The roar and rush of enourmous blocks of ice calving from the glacier is truly impressive. 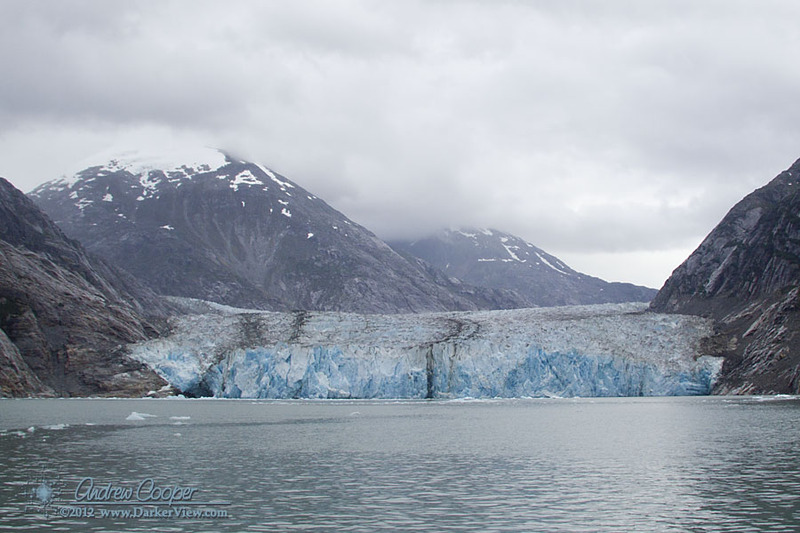 The classic glacier visit near Juneau is a tour of Tracy Arm. This is the desitination of the fast tour boats that run from the cruise ship docks in Juneau on day trips to see the ice. A classic fjord, Tracy Arm is one of the most spectacular sights to see in a state where the definition of spectacular is set high. Some times Tracy Arm is difficult to access, the ice often jams the channel between the cliffs. Accessing the glacier is difficult or dangerous for a small vessel, a game of navigating the shifting rafts of ice swirling on the tide. Often there is no choice but to push through the smaller blocks of ice at low speed, a nerve wracking experience as the ice bumps along the hull. 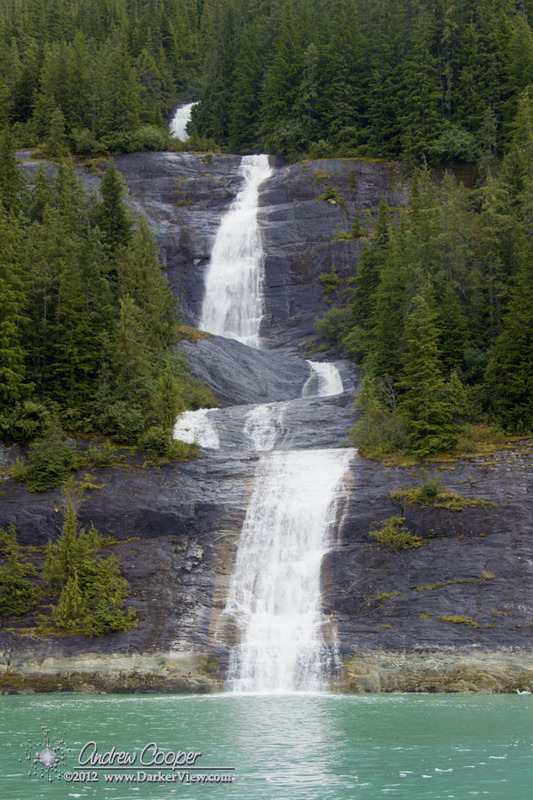 There is an option to Tracy Arm, the nearby and lesser known Endicott Arm is also a good choice. Endicott also features a tidewater glacier, Dawes Glacier. When Tracy Arm is difficult to navigate, Endicott can be easy, depending on the weather or the activity of the respective glaciers. While Tracy sees a steady parade of boats, one is often alone in Endicott, perhaps one or two other craft passing by in an all day visit. The fjord is not quite as narrow as Tracy, as a result can be less clogged with ice and more approachable. The shorter length of Endicott allows for a faster in and out journey. The scenery is classic fjord, particularly nearer the glacier, where the sheer granite walls soar thousands of feet above the water. This is raw land, newly freed from the grip of ice. This glacier is as good as any in Southeast Alaska, a wall of ice hundreds of feet high and half a mile across greets the traveller. There are actually three glaciers arriving at the sea here. A prominent medial moraine betrays the fact that two large glaciers combine to form Dawes. A smaller glacier can be seen adding to the flow from high on the north side, above the face. Another glacier with an impressive icefall can be seen in the hanging valley just before Dawes on the north side of the fjord. Like Tracy Arm, entry to Endicott can be complicated by tidal currents on entry. An old terminal moraine forms a bar at the entrance through which an astonishing amount of water must flow each tidal cycle. Entry should be executed with due caution. Part way down Endicott is a resonably sheltered anchorage found on the charts as Sanford Cove. 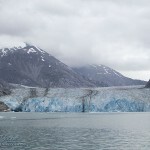 This entry was posted in Geology, Places, Travel Hints and tagged Alaska, cruising, Dawes, Endicott, fjord, glacier, ice. Bookmark the permalink. Dawes Glacier! It was fantastic and beautiful and huger and …! We were the only ship there and we got it all to ourselves. I can’t say enough about it!